← When cost cutting backfires. Seth Godin is a favorite of mine. Here is an excellent blog of his. Please click on the link below for the text that accompanies this graphic. How much time do you spend actually performing your job vs. doing other related tasks? Post your answer and comments below. This entry was posted in Business, Uncategorized and tagged business, efficiency, marketing, organized, productivity, time management. Bookmark the permalink. 3 Responses to How productive are you? Watts Humphrey in developed the Personal Software Process (PSP). It is a follow-up to the SEI’s (Software Engineering Institute) Capability Maturity Model (CMM). Its intent is to provide a structured way for a software engineer to plan, estimate, measure and track their work. At EDS, the last place I worked in corporate America, one of the team members was enamored with the PSP and therefore built a spreadsheet designed to allow one to track every minute associated with every task throughout one’s day, by hour. I already had a spreadsheet that was different but with macros developed along with the spreadsheet I could produce reports reflecting the same data as the PSP spreadsheet. I was forced to use the PSP spreadsheet. I had such a varied set of tasks that were constantly swapping themselves in and out of focus that the tracking of minutes per task didn’t lend itself to productive effort. However, I used the PSP as required and every time a different task came my way, I put an entry into the spreadsheet to halt the current task. I added an entry to account for updating the PSP spreadsheet and added a new entry for the interrupter task. “We” weren’t at all pleased with me because my PSP spreadsheet reflected how much productivity was actually lost due to filling out a minute-by-minute spreadsheet throughout the day. Needless to say, productivity was not rampant. Interesting Jeff. The situation you describe occurs all too often. The practice of tracking and reporting activities can become so burdensome that the reporting cost exceeds the value of the information derived from the reports. As you know, we worked together to develop a tool for sales people to report on some of their key activities. We made certain that the tool was easy to understand and use, and the reporting took very little time. Think about the case of the photographer above and the pie chart on the right. 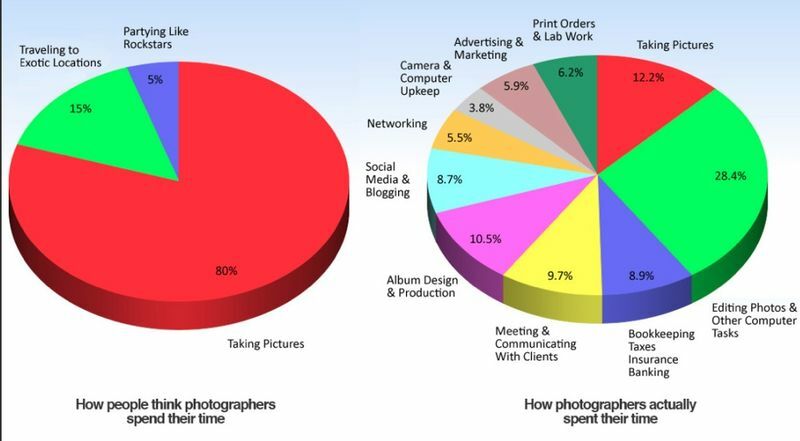 What Godin suggests is that though all the activities listed may be essential to running the business, even for an entrepreneur, they might be better outsourced so that the photographer could spend more time taking pictures. I’m planning a future blog to discuss some of the material from Timothy Ferriss’ best-selling book “The Four-Hour Work Week” that covers time management and productivity in an entreprenurial environment. Hi Art, I’ve noticed that all too often in an effort to “improve” processes, procedures, or job aids, people frequentl;y rush out to collect data. One can hear the frenetic shout, “We NEED data” throughout the firm. Unfortunately, as is often the case, best intentions don’t render best results. Often as time passes and experience reigns, those wanting to use the data realize that they have been collecting data that is as useful as a gelatin bikini; it might be pretty but will disolve as soon as it gets wet. Once this realization come to the forefront the collection of data can back up a bit to adopt the “goal, question, metric” paradigm where first a goal is identified, then it’s questioned to determine what data is needed to understand the process and finally it’s followed by the collection and analysis of the data. In the case of the photographer, it makes sense to farm out all non-photography work only if doing so allows for an increase in business with attendant earnings to offset the farming costs. As is, in almost all cases, the old “it depends” caveat sneaks in to soften the decisions associated with either doing onself or farming out to others. I suspect that, with the photographer, a mixture of doing and farming is optimum.